Berkshire Country Day School - Independent School PreK-9 - How We Celebrate 'National French Week' at BCD! How We Celebrate ‘National French Week’ at BCD! National French Week is a country-wide celebration of all things French, organized by the AATF (American Association of Teachers of French). 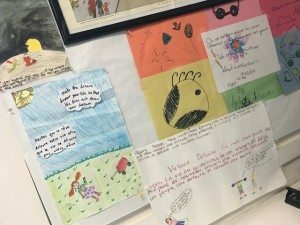 This year marks the 17th year that this tradition has been celebrated with activities and projects taking place in schools, communities, and AATF chapters across the U.S. This year it spanned from the 1st – 7th of November, and here at BCD we celebrated in our own unique way! 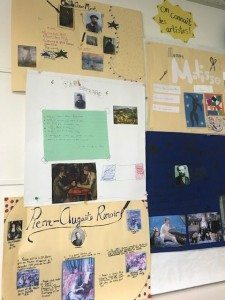 Each class level was assigned a different theme to focus on from French art, to music, geography to literature, with French cuisine peppered in…bien sur! In our 4th grade classroom, students created their very own ‘Mon Restaurant à Moi’ menu, geared towards and highlighting classical French dishes. It was a great exercise to promote students creativity, as well as learn what makes French cuisine unique. In 5th grade, the students were each assigned a famous French artist, such as Monet, Renoir and Cézanne. They each excelled in their research and understanding of the artist to whom they were assigned and came out of the project knowing more clearly why these artists and their works are still revered today. Our 6th graders focused individually on a quote from the novel Le Petit Prince which we have begun to read in class. They took their quotes home to delve into the meaning of the quote and asked themselves whether or not they agreed with the message the author was trying to convey. They then presented their project to the class, in French, including a drawing or painting which they felt helps depict the meaning of the quote. In the 7th grade, these young music-lovers chose a favorite contemporary or classic French musician to present to the class. The artists ranged from Debussy to Zaz, Vanessa Paradis to Satie. It was a wonderful overview of the richness of French musical history, showing firsthand the diversity and range of the genre. 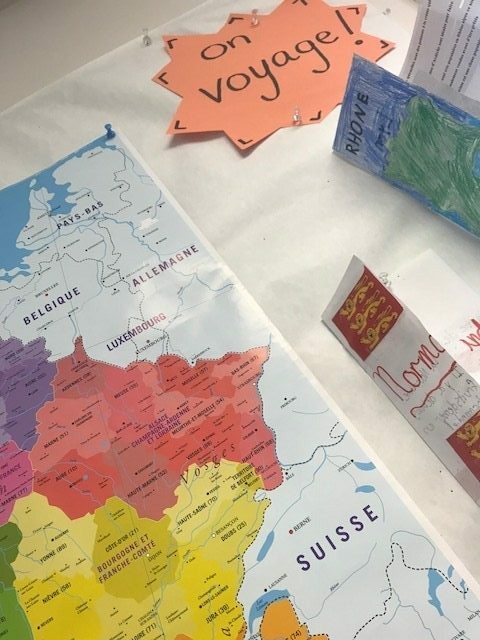 Our 8th graders just wrapped up their first trial-run of being a ‘guide de tourisme’ and presented in pairs on a particular region of France. Each pair created a 3-fold brochure with which they highlighted the cultural attractions and historical relevance to the area, as well as regional culinary specialties. They all did a great job in ‘selling’ their regions to potential travelers/classmates. Each class, no matter the content, learned something new and pertinent to the country whose language we are immersing ourselves in this year! Learning a language is not an approach through which books and resource materials are the only useful tools. 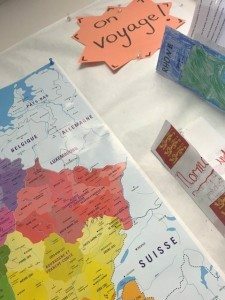 Being familiar with cultural specifics of a country plays a major role in the second language immersion experience, and will come into play throughout our curriculum at each grade level throughout the school year. S’il vous plait, come by our French room to see the students work!